An online car care retailer has been hit by a raid on his warehouse in which all of his stock was stolen from the warehouse. 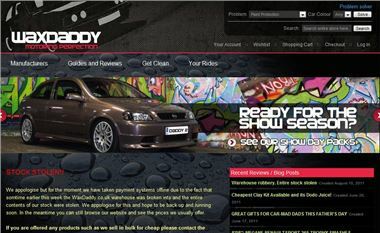 The owner of the Wax Daddy website, Matt Gribben, was away at the Ford Fair car show and returned to the warehouse premises to find everything had been taken. The warehouse, at Accrington Mill, Lancashire, has only been used by the company for a relatively short period of time. Gribben posted an update on his Twitter feed and on the website to let customers know that he is, currently, out of business and unable to fulfil any orders. The website he runs normally sells everything necessary for cleaning, polishing and perfecting a car, from microfiber cloths to the most extravagant of waxes. The business is based in East Lancashire, so if you’re in the north of the country and are offered bulk amounts of any car cleaning products in suspicious circumstances Matt kindly asks that you contact the local police or the Wax Daddy website.